What to Wear to Work in Winter and Summer? 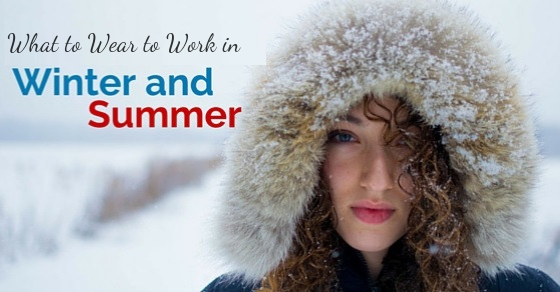 Regardless of the seasons, dressing to an office is very important for each employee. Dresses portray your character and individuality. It is always advisable to have monochromatic and neutral colored outfits. The monochromatic themes work particularly well with office outfits like skirts, shirts, trousers and pants. Even in summer, despite of heavy heat and humidity an employee must look his best. There are no concessions for an employee and he needs to wear a formal outfit even in the worst weathers. The only thing an employee can do is to have a better choice of office attires. Here we have made few suggestions on what to wear to work during summer or during winter so that you make an impression, while you still stay comfortable. Summer is a season when you really wish to break all the dress code and wear something really short and skimpy. Full-length summer outfits and attires are really uncomfortable. Yet, there are no concessions when you are professional. So here are some style tips and suggestions on what you can wear to office in summer to feel comfortable while still adhering to the dress codes. The right colour choices can make a big difference. It is always recommended to build summer wardrobe around light neutrals like white, taupe, tan or pale gray. These attires help you look summery as well as sophisticated. You can also try the new combination of white and navy too. Light and cool colours are known to keep your mind cool and stress free. These are great choices when it is mid summer and you are already frustrated with the rising heat and humidity. Colours like yellow, orange or any of the warm colours should be strictly avoided during summer. You must keep in mind the fact that in office, you need to behave like a professional. You may be extremely tempted to wear short and comfortable outfits in hot summers. Women may prefer short skirts or body hugging short one pieces but they may not suit your work culture at all. Sloppy or somewhat skimpy summer dresses to office can be distracting for co-workers. It also affects the productivity and customer service. So always try to balance the needs of the clients and corporate culture while selecting the optimum dress code. You must remember that these things are also noted down when you performance review is done. One trick to look really professional is to wear wrinkle free and well maintained clothing. Either you choose a suit or dress, always look for lightweight clothing. But it should be a wrinkle-resistant fabric like silk- linen or cotton blends. If you opt for cotton attires or other fabrics that wrinkle easily, you will have to invest some time and effort to press it and maintain it in the best condition. In today’s hectic work environment, no one has time to invest on such trivial activities. So it is best to opt for wrinkle resistant fabrics that are easy to wash and maintain. Summer work outfits don’t imply that one can be a slob. No matter what is the time of the year, it is always important to maintain a professional image. So make sure your clothes are clean and presentable. The busy modern work life often prevents people from investing sufficient time on household chores. But this is really no excuse to be untidy and unhygienic. You must make sure you present yourself as tidy and hygienic even on the hottest summer day. Summer clothes tend to be more casual. So proper accessories can easily add spark, sophistication and polish. Especially for women, a statement necklace, oversized watch, simple jewelry or bracelet suit the best to match with formal outfits. In summer, many of us sweat excessively. If we travel long distances to reach office, we need to prepare for such travel. It is a great idea to carry an extra pair of socks, especially if you have a problem of body odour. Men with body odour problem should also carry deodorants with them so that they may stay fresh all through. It is a great idea to carry a packet of fresh wipes with you. It helps you stay fresh even on humid days. Well trimmed short hair for men also help you stay more comfortable during hot summers when the heat is really unbearable. A comfortable employee is always more productive. During the work or for an upcoming business engagement, planning wardrobe ahead always pay off. Especially in winters, it is good to look for the best formal outfit well in advance so that you always go well dressed to your workplace. Here are few of the tips for selecting the best casual winter outfits. Winter weather is comparatively tough. Your clothing should be warm as well as stylish. By selecting the proper winter work outfit, you can attain both. A good quality winter coat is the most important thing to invest in. There may be several jackets and winter sweatshirts in the market. But only a few professional jackets give you the perfect corporate look. You need to visit several showrooms so that you get hold of the best and most well designed jacket to go with your persona. In professional life, some of the traditional styles still work very well. This applies particularly well in case of suits for men. They need to look the classy and professional way. You need to pick a suit that goes well with your height and stature. There are many designs and styles available and you should know what will suit you best. Winter business outfits like suits makes a man look exceedingly dapper. Moreover they help you to keep the body bit warmer while working in the office. Along with plain black or grey suits, pinstripes are also a good option. It is great for sliming the figure with a sophisticated image. Women usually prefer to wear full length formal outfits for winter. These attires protect you well from the cold weather. Yet, if you think formal skirt suits you best, you may wear it in winter too with some additions. For wearing skirts in winter, it is recommended to style them with over knee high boots or customized tailored thigh high stockings. For this, a woman can always go for black dress with a white coat. The colour choices should be made keeping in mind your style statement and what colours would go best with your persona. Women look great in whatever they wear and any addition to their existing style only adds to their beauty. Heavy fabrics in one way are bit uncomfortable. That is the reason why many women prefer to opt for a scarf rather than thick fabric jackets with hoods. Scarf can protect you to a larger extent. Moreover wearing a scarf always complements the suits. You also have an option to select the scarf of a colour that blends with your skirt or suit. There are many varieties of scarves. They even come in floral and designer patterns. Winter always comes with additional necessary accessories. It is always advisable to select the best suited ones of them starting from Gloves, Skinny Pants, Boots, Cashmere Sweaters, Long Johns or Wool Scarf. Men need to look for best shoes that go well with the cold weather. They may also have to look for good quality jackets that resist the snow and cold weather. You need to be prepared in advance for the cold winter weather. In most countries, the two main seasons are summer and winter. Hence, very few people guide you on how you must prepare for monsoon as a professional. Here we have listed down some quick tips that help you stay prepared for monsoons and those unexpected showers. Purchase some all season footwear for regular office wear. Such footwear won’t be affected by an occasional rain. Usual leather shoes stink if they get wet so you need to strictly avoid these if you are residing in a monsoon region. Carry a raincoat so that you may protect yourself from the occasional showers. You may keep a spare pair of formal attire in your office shelf that you may use when your regular outfit gets wet. Always keep your mobile phones fully charged. You should also carry a power bank with you incase of power failure that is common during the monsoons. A thorough professional stays thoroughly prepared for any seasonal changes. He is never deterred by any challenges. Better preparedness ensures that he maintains his professional image even during the worst weather conditions. These simple tips will help you be equally professional.